Ninety incorrect positions are better than one correct position. 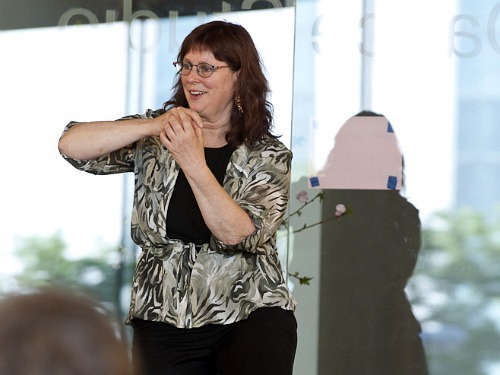 This was one of many ideas that Julie Lyonn Lieberman shared in her lectures about the ergonomics of violin playing at the 2011 Starling-DeLay Symposium on Violin Studies at Juilliard. Julie comes at the subject from many angles: violinist, educator, author, radio producer, composer, recording artist, journalist, composer. (And she was the violinist in the Fiddle recording for Music Together, very cool indeed!) Her 1991 book on healthy playing, You Are Your Instrument, was revised in 2011 and is available both in hard copy and as an e-book. Julie talked about the ergonomics of playing the violin, about how muscles work and about how to go about finding the right set-up in terms of chin rests and shoulder rests. Julie Lieberman. Photo by Nan Melville for The Juilliard School. Part of our problem, as violinists, lies in the fact that we remain in one awkward position for a very long time, on a regular basis, Julie said. 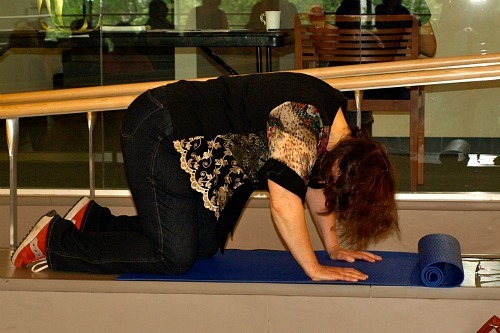 "The sheer act of trying to maintain a posture brings tension in the body," Julie said. You may even stop breathing when you "assume the position." "If you are constantly changing positions, no problem," Julie said. "I go for a set-up that keeps me moving as I play." To prove the point, Julie had us all get in playing position, arms suspended in place, but without our instruments. "Okay, see you in two and a half hours!" she said. She had us hold the position for only about two minutes, but that seemed like an eternity. "How is it that we can do all kinds of weird things for hours and hours and not notice until after the fact, but we can't hold it up for a few minutes when we're miming?" she asked. The reason is that when we were miming, we were in "receiving" mode, when it comes to the nerves, and we can notice how we feel. When actually playing, we are in "outgoing" mode, charging our nerves with the task of playing the fiddle. The trick is to schedule some "receiving" mode time, while we are playing, to make sure we aren't injuring ourselves. In other words, make a conscious effort to check your body, check your breathing, and check your muscle tension at intervals while playing. When working with students, teachers should "find as many ways as possible to get them breathing when they are learning to hold the instrument," Lieberman said. We started our first session with Julie by doing some stretches to focus on this kind of awareness and breathing. Julie said she tries to focus on doing exercises and stretches that are kinesthetically aware: nothing that is overly willful or forced. And the more you can accomplish through using the body well and preventing injury, the better. "Scar tissue is our enemy," she said, "we want to do anything we can to avoid surgery," she said. In the first stretch, we laced our hands behind our heads, then gently opened our elbows to the side, while exhaling. When you exhale, that tells your muscles to release. To make sure you are actually exhaling, you can trill your tongue or lips. Another exercise would be to push out, one hand at a time. This stretches the forearm muscles but without forcing them unnaturally. It also works the opposing muscles, and strengthening opposing muscles is a big key to creating balance and healing in the body. She said that people used to joke that you can tell who is a violinist on the Upper West Side just by looking at them: they hold their left shoulders way higher than their right. One exercise she showed for relaxing the shoulders was to lift the shoulders against some resistance -- which would be another person gently pushing down. After that, when you relax your shoulders, the shoulders will seat back a little lower. Violinists should also be aware of the tendency to lock the knees. Locked knees cause the lower back to hyper extend and make the hips point to the floor. Strong abdominal muscles also will help support the lower back, and Julie recommended pilates as excellent exercise for the abs. "Every movement the body does involves the abdominal muscles," Julie said. "The more tone strength we have throughout the body that's balanced, the better." If muscles are not used, they can atrophy, or lose their strength and mass. However, "be aware of the muscles we over-use," Lieberman said. "Our body will turn to the muscles that are strongest, to cheat." This can mean bad news for a musician who has over-developed certain muscles from playing, without developing the muscles that counter them. Sometimes a physical therapist can actually make the situation worse, prescribing the "usual" exercises for a particular problem, not knowing all the repetitive motions we do as violinists. You don't necessarily want to strengthen muscles that are already strong, or already over-developed. Julie explained that when we are born, we all have fused tendons between the pinkie and ring fingers, even though the other fingers all have individual tendons. This is one reason why the ring finger can be difficult to lift. But the solution is not to drill the finger into submission, "Don't fight against a genetic condition." She said she once encountered a wind player who had drilled his pinkie and ring fingers -- with exercises recommended by his teacher -- to the point where he could never use them again. This is not something we'd ever want for ourselves or our students. Instead, we need to be aware of how our hands function. For example, another innate condition in the hand is the fact that the muscle in the thumb rings around the hand and attaches to the pinkie. Thus, "the more relaxed our thumb can be, the more movement we can have in our pinkie," Julie said. One way to tell if you are holding tension or squeezing unnecessarily is to stick your left thumb into the palm of your right hand, then put your fingers on the back of your hand. Try lifting and setting down the fingers, as if you are playing. Do you feel a squeeze? If so, you may be tensing too much with the thumb. Here's another interesting idea to consider: the brain's visual cortex is huge, whereas the auditory cortex is a little blip on each side of the brain. "When a person uses their eyes, the other senses shut down 75 percent or more," Julie said. This has implications for beginners. How much attention can they pay to their bodies, or the sounds they make, if they are learning to read music at the same time as they are learning to hold and play their instrument? "Suzuki was really onto something, building the muscles and the auditory complex independent from the eyes," Julie said. Playing the violin can be a pain in the neck -- violinists run a major risk of neck injury from playing. So how can one prevent it, or treat it? Julie recommended a gentle approach. One simple stretch involves standing straight and allowing the head to relax forward, then to either side. But don't put your hands behind your head and push your head down; "We're really not about forcing things," she said. And don't do something like hang your head over the side of the bed; that creates a taxing position for the neck. Instead, simply allow weight of the head to elongate your neck and imagine it expanding like a giraffe, as you stand and let it hang. Then tilt to one side, imagining the ear coming to the shoulder, but don't force anything, and don't allow the torso to lean one way or another. Just stand straight, nose forward, with hands at your side. You can also inhale the head straight up, then exhale to the side. Then you can go at angles, exhaling the head in the direction of the collarbone. One way to help stretch over-developed muscles, such as the ones in the neck, is to strengthen the opposing muscles through "active isolation." The best neck exercise for violinists, Julie said, can be found on page 112 of her book, You Are Your Instrument. This exercise is a little bit like Cat and Cow in yoga, but it has an important difference: in Cat and Cow, the spine carries the head. In Julie's exercise, the neck is isolated. Allow your head to hang down, which stretches your neck. But don't arch your back! Turn head to one side gently, then turn it to the other side. Another big problem for violinists is our overall set-up, and whether it has us clenching left constantly, or tilting forward. Problems arise when one holds the same position for hours on end. Your shoulder rest and chin rest set-up has a huge influence on how you play, and the set-up will vary from person to person as much as our physiques vary. It all depends on where your chin naturally falls on the instrument, where your neck attaches to your torso, the length of your torso, the length of your arms. As a child, Julie's shoulder rest solution involved putting stacks of Dr. Scholl's foot pads on the back of the instruments. She also had one of those dreaded hard-as-a-rock corduroy contraptions, and both were a disaster for her, physically. Teachers need to honor the individual and find the set-up that works for their body type, Julie said. It's all too easy to set students up for debilitating spine, neck, muscle and overall posture problems, and "if that is the legacy we pass to our students, that is problematic." When it comes to shoulder rests with screws on both sides, the first thing she does is to switch the long screw to the the shoulder side, as that makes for a better tilt for getting to the G string. She has had success with the Knilling Viva shoulder rest; "I find this one works well for a number of body types." The feet swivel on this rest and allow for slightly more adjustment than with the Wolf Forte Secundo, which is also a good choice. The Bonmusica shoulder rest seems to work well if you have a wide shoulder and long torso. If one is scrunching up the shoulders to reach the violin, then it's time to think about building up the chin rest side of things. When it comes to the chin rest, Julie generally recommends a flatter, broader-plated chin rest that allows more options for the head position, so that one is free to move and not locked into one place. Also, "I don't believe in something sticking into your jaw," she said. Something called the Impressionist Chinrest Comforter can help; it sticks to the chin rest and takes an impression of your jaw line to create a custom fit. This might be a good solution for some, though Julie cautioned, "once you have that impression, you can't move your neck around as much." Along the same lines is the GelRest, which comes in multiple colors. If the chinrest seems to be the right shape but just needs to be taller, you can simply put cork underneath it to boost it up. Then there's the Strad Pad, made of washable latest foam, which is thin and wraps all the way around from the chin rest to the back of the fiddle. It can be comfortable, but make sure it's not pushing the violin away too much, Julie said. Many violinists express concern that a shoulder rest will dampen the sound of their instrument or that it will keep them from feeling the vibrations. "Pay attention to how your instrument talks to you what you try things out," Julie said. But keep in mind that a position that thwarts your efforts by causing pain and injury will also affect your music-making. "When you find the right formula for a certain individual, their tone increases exponentially because they are working more ergonomically." Very young children can often get by with less of a shoulder rest, but make sure they are playing with ease and comfort. It's well worth reducing the vibration of their violins a little bit in order to get them on the right track, playing ergonomically. She said she once made a "practice vest" for a student to wear while playing. You can also use rug padding for a young student. "If it works for their body, fine," Julie said. But teachers should honor the individual and take their health into consideration. "In 21st-century education, we should tailor to the individual. We should never say to a student that it's okay if it's hurting you. If we are in pain, we know we have to change." Julie has said that students have been punished by their teachers for seeking her help and therapy. Julie recommended that a student use the following words, if a physical therapist's recommendations go against a teacher's ideas about positioning: "I saw a teaching rehabilitation specialist and this is what I have to do while I'm healing." Ironically, when someone comes to her for therapy, she does not automatically assume that they want to heal. "Some people are injured because it's the only way to protect themselves from pressure and expectations," Julie said. "You can see it in their faces: they don't want to heal. But this is unconscious." Then, one has to look elsewhere for the source of the problem. If there is a psychological block against healing, it won't happen. But a musician who is on the case every day, with nothing blocking them, should be able to find a way of playing that is healthy. This is valuable reading. Julie is right on the mark about having good abs (abdominal muscles) and good muscle toning. I am a great believer in staying fit; I walk, stretch, and work out with free weights regularly. The benefits are considerable. I'd like to extend the shoulder discussion a bit. I see so many computer keyboards sitting on top of desks. This induces users to lift the shoulders, causing unnecessary strain that can spread downward to the arms and wrists, as I know from experience. I keep my keyboard on a pull-out tray so that the shoulders stay in regular position -- with forearms about parallel to the floor. No problems. BTW, I've never used an ergonomic keyboard, although I'm at the computer several hours a day. "When a person uses their eyes, the other senses shut down 75 percent or more." Haven't tried measuring percentages, but my experience tends to confirm this. In the 103-hour blackout, following the April 27 tornadoes here, I continued practicing and playing each day. The last 60 minutes or so of the evening sessions were in near-total darkness. All of yesteryear's ear-training and drills for shifting, straight bowing, and string crossing really paid off when I had to rely on touch and sound only. The sessions were at least as good as the best ones I've had with the lights on. Love the stretching exercises and all the info! 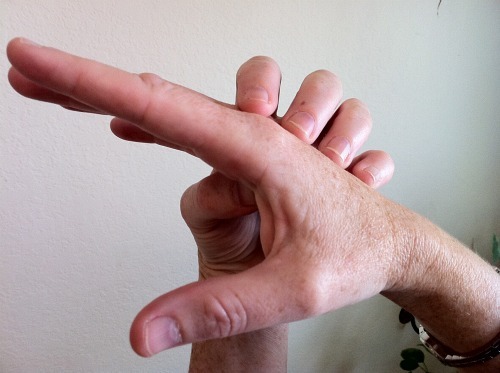 Another thing, the pinky has its own fiber "slaught" for its extensor tendon and it can be a "double tendon". 1, 2 and 3 only have one fiber slaught for all 3 extensors of them and it can be tighter! That means the pinky has a very special flexibility despite beeing week. If ones look at the top of the hand, one might be able to see that. In my left hand, it is obvious that the more stretch I gained over the years if from the pinky. Though the pinky has good stretching aptitudes, experienced players as Repin tell that one should put most of the stretch on the index side to protect the fragile pinky. Also, each time you injure a tendon (ex: tendonidus), it becomes slightly bigger. If it's often injured, it will become bigger and tighter in it's envelope and it will get injured way faster the next time. It might become chronic even. So when musicians tell to stop rather than to stubburnly continue if it hurts, they have a point!!! Jim, absoluntly right! My teacher jokes that the frequent electricity lacks in the soviet russia helped her for "proprioception" issues. Thus: the feeling of the instrument. I saw some advice about the best exercise for balancing the forward acting muscles.The sport of cross country skiing uses all the "pushing back " muscles that are so often neglected. The sticks are used to push you forwards on the level . It`s not the steep down hill stuff. I suppose rowing is another good one . It's an old interview before I joined violinist.com. I have links to violinist.com on my links page and on my email subscriber list. Do you have any other places in mind?